When ordering your Walsall Made, Bespoke/Custom Made English Saddle or sending your saddlery for Alteration, repair, reflocking, stitching etc please Send all mail to: Heritage Saddlery. 5 Oak Avenue. Heaton Moor. Stockport. Cheshire. SK4 4EU. UK. *please remember custom made option for all saddles is an extra £75. But when you order 2 saddles or more this cost goes down to £50 per saddle. Please be aware that there are some very good Youtube videos that will help you with taking the tracings we require. One of either side of horses withers from around 3 feet away. One from side on from around 6 feet away, to show spine shape. One from above. Get on bucket or whatever you can (be careful) and take one from tail to head of the area of back where saddle sits. Take a few general photos of back area too and during all of the template and photo taking please ensure horse is standing on a flat surface with front legs together with horses head up. Please don't send lots & lots of photos. 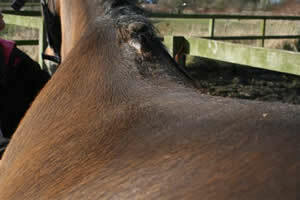 We only need the ones above, just ensure good quality and an extra 1 or 2 of problem areas such as large shoulders etc. The size of saddle you want. To measure a tree size correctly measure from the centre of the head nail/ makers button to the centre of the cantle/back of saddle. The style (include photos if you have them) Print off a large picture of saddle you want if possible and mark onto photo any agreed changes in style etc. If you feel that I need to know your weight/ size then that too and your leg length from hip to knee & knee to floor if you are particularly short or tall. Cantle shape. Round or Square. 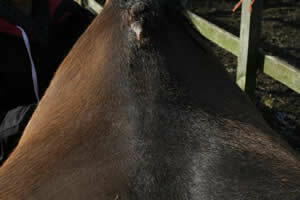 Gullet width, in Cm's, you would like for your saddle. This will eliminate pressure on the spine. Any other details I have requested and/or any other details you wish me to know about you or your horse inc. any past, present back problems or unusual back details like bigger shoulder on one side etc. There are many useful videos on YouTube if you Google around! A: The imaginary level line from the pommel to the cantle. B: The deepest part of the saddle directly behind the twist. C: The points of the saddle tree where we take our measurements using the Flexi-Curve. D: The gap between the pommel and the horse's withers. It is important that when you take the measurement of the horse's withers for fitting the saddle, that you take it in the correct position. With your horse standing on a level surface, take you existing saddle and place it over the horse's withers and press down gently. Now slide it a little back until it comes to rest in a natural position just behind the shoulder blades. What we are trying to achieve is to take our measurement about one to one and a half inches (1" - 1.5") behind the front of the pommel of the saddle. If you lift your outer saddle flap you will see the points of the saddle tree. These are made of wood reinforced with steel. We need to take our measurement directly under these 'points.' See the Fitting Diagram. Taking The Measurements - OK, so now we have the saddle in the correct position to take our measurement. The next thing we need is a little item called a Flexi-Curve. This is obtainable from most office supply stores. It is basically a flexible ruler (a wire coat hanger can be used if a Flexi-Curve is not available). Place your fingers under the saddle about one and a half inches behind the pommel and slide the saddle back clear of your hand. 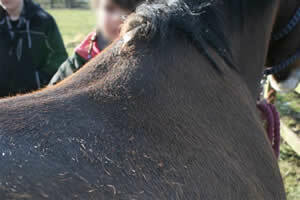 Now bend the Flexi-Curve over the horse's withers in this spot smoothing against the horse to fit the its profile. Carefully remove the Flexi-Curve taking care not to bend it from the shape you have just taken. Now place it on a piece of paper and carefully draw around the inside of this form. Good! We now have the shape of your horse's withers. 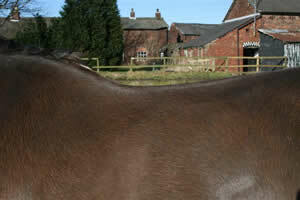 We will need your drawing with your order to ensure the saddle will fit your horse. It must be posted to us (we need the original template). Heritage Saddlery. 5 Oak Avenue. Heaton Moor. Stockport. Cheshire. SK4 4EU. Q: I have been told that a Master saddler must fit/measure my horse? is this true? A: NO it is not true. I know many, myself included, saddlers who are not MS's and who have been in this business a long long time and are some of the UK's best. You cannot learn form a classroom alone in a short time the ways of saddle fitting and more importantly saddle manufacture. I have been involved, and so has my father and his father, in this trade all my life and have fitted 1000s of saddle and measured 1000s of horses and manufactured 10s of 1000s of saddles. That's real experience. Do your homework re saddle fitters. Don't assume a thing. Google about, check the online forums and ask questions. The best way forward is to be told by your stable mates who is good and who is not. If you follow my guide and supply what I ask you'll get a saddle that fits, my feedback, good name and testimonials prove this. Good luck. Matty. Hi Matt, I got in a short ride today to test out the saddle. That is THE most comfortable saddle I've ever sat in. The mare seems to like it too, she was stretching down and was relaxed, two great signs. I will be out of town for two days but back to schooling on Monday so will send more info. So far so good!